The Belfast Giants remain top of the Elite League standings following a split weekend against the Sheffield Steelers. Both teams will walk away relatively happy wit their efforts, yet the frustration will lie more with the Belfast Giants whose defeat on Sunday is the first in domestic competition since mid-October. For Sheffield, a victory over the league leaders was more of a demonstration of the teams resurgence under the stewardship of Tom Barasso. Belfast took first blood on Saturday evening with a 4-2 win, a sparkling opening period and lead by the Giants thanks to David Rutherford was countered in the second when the Steelers upped their game and the pressure on Tyler Beskorowany told when Robert Dowd found the back of the net to level things up. Early in the 3rd , Francis Beauvillier was able to control the rebound to his own initial shot on Matt Clime with the presence of mind to go skate to stick and lift the puck into the net at a tight angle and return the Giants lead. Blair Riley was to double that lead, firing him cleanly from the slot on a feed by David Rutherford. A couple of minutes later the home side regained hope. Eric Neiley, brought down on the breakaway, was awarded a penalty shot witch he duly dispatched and brought the Fly-DSA Arena to fever pitch with a 1 goal game and under 10 minutes to play. 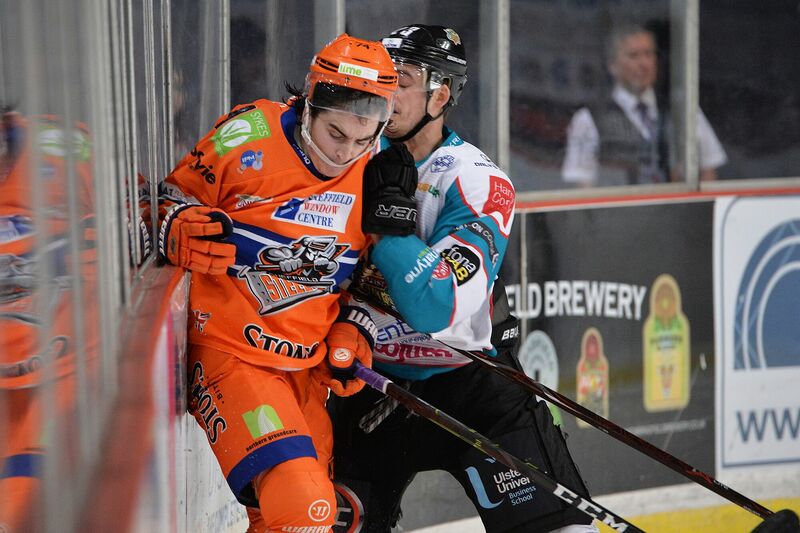 However, with Clime pulled for the extra attacked and over 2 minutes to go, the Giants finally took their opportunity and Darcy Murphy put the puck in the empty net and rounded out the scoring 4-2, sending the, over 200, visiting Giants fans in to hysteria and out into the Sheffield night to celebrate. Sunday, was to be a different affair. Clime was replaced by Jackson Whistle, while Jim Vandermeer was replaced by Guilliame Gelinas for Belfast. The game started with a wonderful moment when 8 year old Aden Dodd-Marsh walked to centre-ice to “Ring The Bell”. The young lad had battled cancer for 3 of his 8 years, and having successfully beaten the disease, he rang the bell to the cheers of all sides of the Fly-DSA Arena. Another superb example of how the sport can transcend the action on the ice and bring a community together in celebration for a young lads achievements. When the game itself got under way, it was the Steelers who started with a jump. 2 goals from Robert Dowd in the opening 5 minutes set a high paced, high challenge tone that a Belfast Giants side, who looked increasingly tired as the game wore on, were unable to match. Early in the 2nd Josh McFadden made it 3-0 and a lovely powerplay finish from Ben O’connor through traffic made it 4-0, and still over half the game to play. A game of frustration for the league leaders who’s attempts to create infront of Whistles goal were all too often snuffed out as the puck bobbled to a Steelers stick, or the chaos in front of goal was clear away. Likewise fatigue was setting into the Giants side on their 5th game in 8 days. Loose passes, shots that strayed from target and tired turnovers dogged the game as the Steelers looked to lock down the second 30mins. Steelers efforts to do this would also have the unfortunate consequence of Davy Phillips pleaving the game what is reported to be a suspected break to his wrist. We wish him well in recovery. The Giants would hit back, Francis Beauvillier in the 2nd period and Blair Riley in the 3rd would both get their 2nd goals of the weekend. Yet the Riley goal, in particular, coming with 57 seconds left and Beskorowany pulled, felt more like a consolation for the hard, yet tired work the Giants put in over the weekend. A disappointing Sunday, 6 goals each and 2 points a piece from the 2 games, Sheffield Steelers fans left wondering where they may have been had this team and ethos started the season with the form they currently hold. 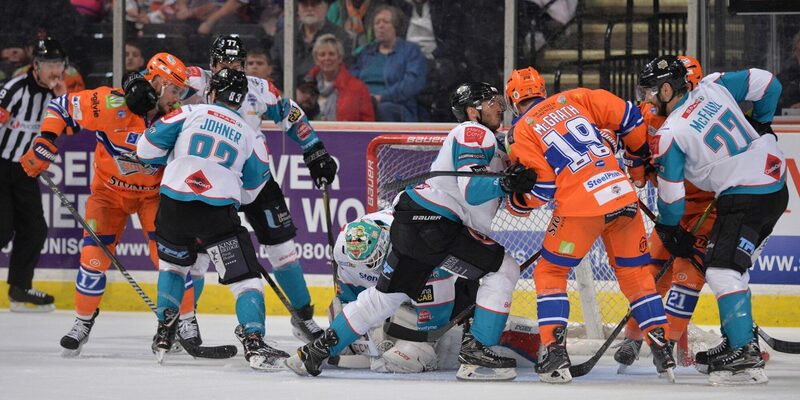 While the Giants will attempt to rest up and regroup for another trip to Dundee on Wednesday. Safe in the knowledge that this epic 17 game domestic road swing has passed 15 games, with only 2 defeats and only 2 games left before returning to the SSE Arena on Sunday to face the Cardiff Devils.